I had a request during the week from a family member to make a classic Christening cake for a family friend. Given that I haven't made any kind of cake since my own wedding cake back in January, I was up for the challenge and happy to have an excuse to dust off my cake making tools. I've been really out of routine the last couple of weeks and this has been my first proper opportunity to get in my kitchen to make something creative. This cake comprises of two layers, a red velvet cake with cream cheese frosting and the bottom layer is a rich chocolate cake with chocolate fudge frosting. 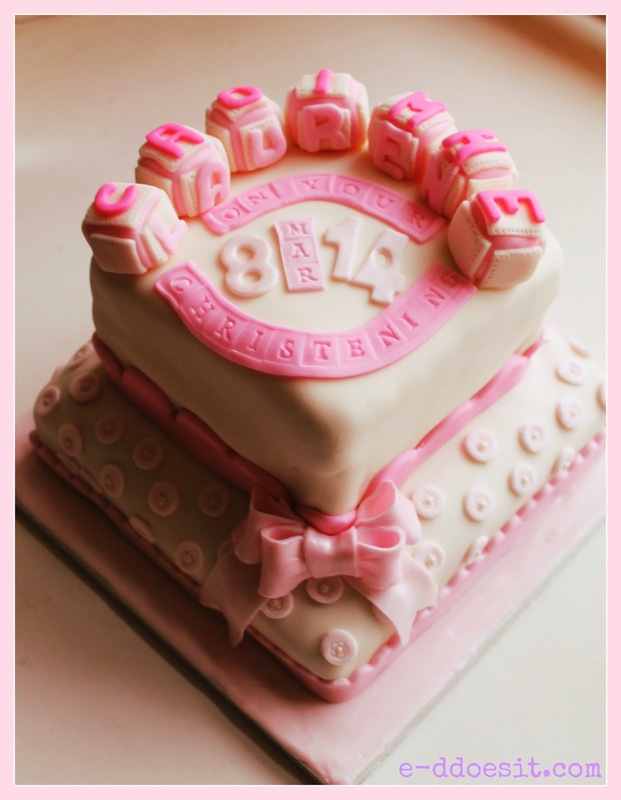 The decoration was kept simple using ivory fondant along with various shades of pink. Polka dots, bows and baby blocks helped put the finishing touches to this edible creation. Beat the icing sugar and butter together in a free-standing electric mixer with a paddle attachment (or use a handheld electric whisk) on medium-slow speed until the mixture comes together and is well mixed. Add the cream cheese in one go and beat until it is completely incorporated. Turn the mixer up to medium-high speed. Continue beating until the frosting is light and fluffy, at least 5 mins. Do not over beat, as it can quickly become runny. When making red velvet cake Dr.Oetker Red Food coulouring really is a must. In all my years baking and after lots of trying and testing I have yet to find a brand which produces the same deep red colouring in this cake as the Dr.Oetker liquid red colouring (not the gel! ).